Today is momentous when we remember this, October 1st, was the day 150 years ago when the ship Lincolnshire ship pulled away from England ready to head to Australia (although one reference suggests the departure date was September 30th – I guess it would have depended on the tides). October 1st was a Monday. A new week. A fresh start. William Baker Tyzack, his wife Charity and four children had come on board on Saturday 29th September, and would have mingled with those saloon and cabin passengers who had sailed from Gravesend in London a week earlier on the 22 September. It seems money was tight for William, because the cost of (perhaps train) travel to Plymouth via London must have been cheaper than sailing from London. Did William and his family step off the Lincolnshire on Sunday and take themselves to church to pray for a safe voyage? 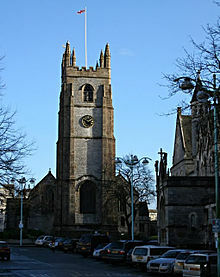 Plymouth is located within the Anglican Parish of St Andrew. If they did go to the church, located approximately 2 kms from their ship, then John Hatchard would have been the vicar. Hatchard came from a family that owned a bookselling and publishing house in London, so I can imagine his sermon could have been quite erudite. St Andrews was a church that had attracted distinguished visitors by the time our ancestors were in Plymouth. For example, Elizabethan seafarers including Drake and Hawkins, various Kings of England, and Sir Joshua Reynolds with Dr Samuel Johnson had attended services. On the Lincolnshire’s previous run to Australia arriving in April, well known Tasmanian identity Mr Morton Allport had gently packed salmon ova with damp English moss to help start that part of Tasmania’s fishing opportunities. I wonder whether new boxes of ova were stowed in the hold when William and his family sailed – if so, he could not have forecast the massive salmon industry that has emerged and which currently helps support Tasmania’s economy. The journey into the unknown had begun. So they were away! Did you know? Weighing anchor literally means raising the anchor of the vessel from the sea floor and hoisting it up to be stowed on board the vessel. At the moment when the anchor is no longer touching the sea floor, it is aweigh.